Bluefish gets a bad reputation as a "fishy fish," so I was surprised to see it as a reoccurring feature on the menu for a chef I work under. Bluefish is a great canvas for robust sauces, he explained, especially ones involving black pepper, lots of acidity, or strong spices. While talking to him about his affinity for bluefish, he gave me the wonderful idea to try curing it. Really? 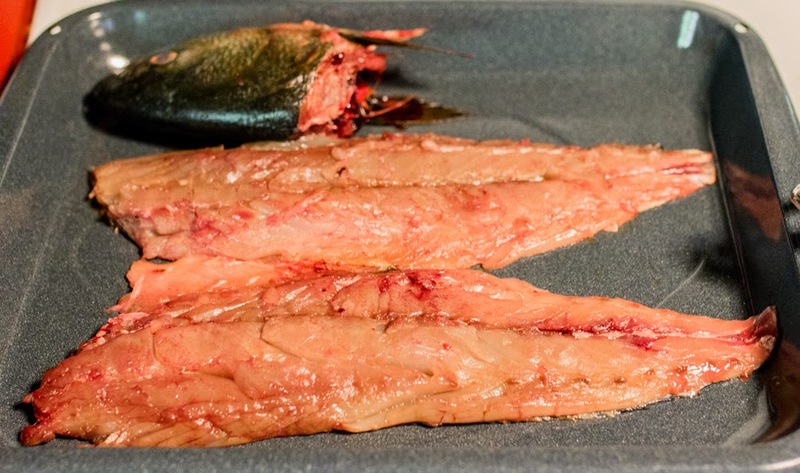 "Bluefish has a similar fat content to salmon, so it takes to cure really well." My father-in-law, Carl, was also a big proponent of eating bluefish. Whenever we would go to the Outer Banks, Carl and Matt would catch a mess of small bluefish. Cleaned and cooked that day, they were perfect served plain with salt and pepper. Carl would always smirk when people gave him odd looks for saving the bluefish, rather than tossing them back in hopes of something fancier. "They don't know what they're missing," he mused. As I approached this recipe, I felt encouraged by my past experiences cooking bluefish...but those were small North Carolina bluefish. 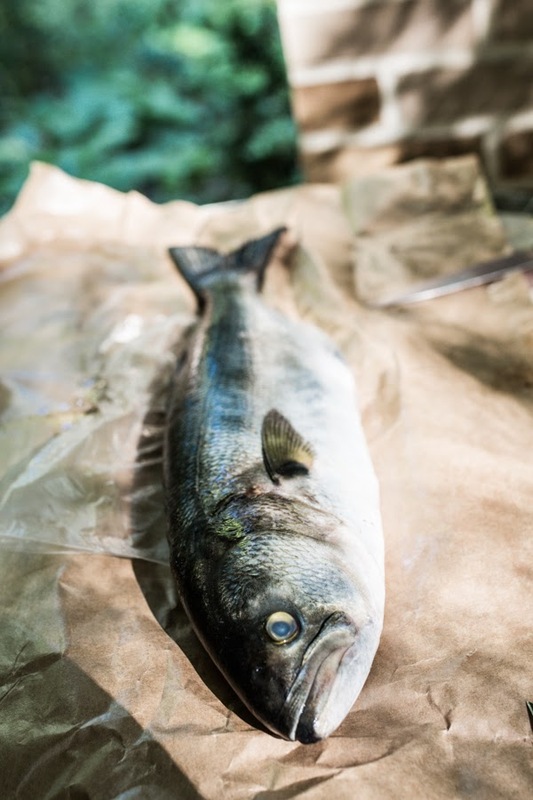 For curing, I had a larger New Jersey blue with an oval body the size of a small Coho salmon. Still, the meat smelled clean and fresh, despite its dark, ruddy-colored flesh. I cured it simply, with salt, brown sugar, and dill. I added a bit of caraway and white pepper for seasoning, wrapped it up, and stashed it in the fridge for three days, flipping once a day to distribute the cure. Opening the package, the fish smelled nice, but looked a little lumpy. It didn't have that nice, sleek, smoothness of salmon. After rinsing off the spices and excess cure, I let it dry out in the fridge for a night to firm up. When it came time for a brunch of bluefish on toast points, I was excited but hesitant. Slicing into the fish, it came off in a nice little rosette. The meat was savory, tender, and not anymore fishy than cured salmon. Granted, if you don't like smoked salmon, I don't see this converting you. But it was surprisingly mild, especially considering how strong large bluefish can get if not cooked right away. 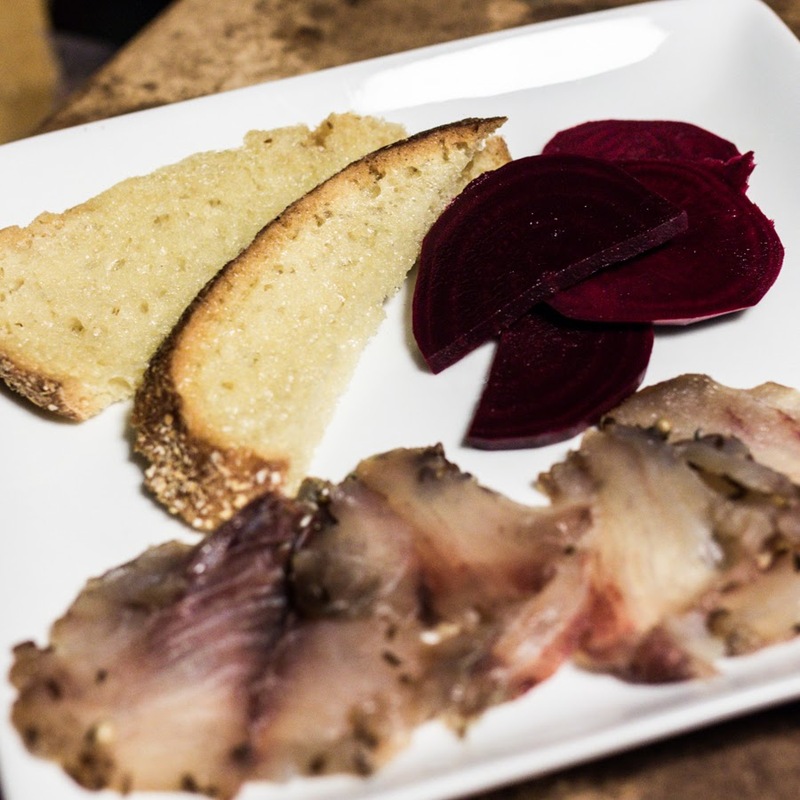 I served it with slices of pickled beets, which added a nice acidity to cut the richness of fish. I would definitely do this recipe again, possibly side-by-side with cured salmon as a duo to compare and contrast. Thanks for the inspiration. I caught a few Bluefish yesterday. I planned to hot smoke them but will do a few fillets gravlax style.